If you’re looking for a twin-humbucker classic-style solidbody, the Sunburst should be on your radar. It looks the absolute business, plays great and offers a load of classic rock tones. Those conditioned toward a more vintage fingerboard radius might find the Hamer setup flatter than they’d like. While all that ‘This Is Your Life’ stuff above might make for perfect bedtime reading, there’s one question we all want answered: is this Hamer reboot worthy of that illustrious headstock logo? Well, kicking off with the new Sunburst, there’s no mistaking those classic good looks. The Sunburst answers a ‘what if...’ We mean, what if Gibson had stuck with the original mahogany/maple Les Paul concept in the early 60s but followed that decade’s double-cut trend like Fender, Gretsch and its own Junior and Special models? Joe Bonamassa would be chasing something very similar to the Hamer Sunburst. Following that logic, it’s no surprise that the Hamer features a mahogany back with a maple top. This classic combo is super- sized in the aesthetics department with a beautiful flame maple veneer and Cherry Sunburst finish. The mahogany neck comes spec’d with a Gibson-style 629mm (24.75-inch) scale length, a slippery 42mm wide graphite top nut, a flattish 400mm (15.75-inch) radius ebony fingerboard and 22 medium jumbo frets. As you’ve already worked out, the Sunburst is brandishing a pair of ‘zebra’ bobbin humbuckers that are each wired through a volume knob, a shared master tone and your classic three-way pickup selector toggle switch. The big surprise is the bridge. You were no doubt expecting to find a tune-o-matic job and its stopbar- shaped amigo. No, here we have a six-saddle hardtail arrangement with through-body stringing that aims to replicate the original Hamer Sustain Block bridge. One of the best necks this writer ever encountered was the fat D profile on an old USA Hamer Sunburst. 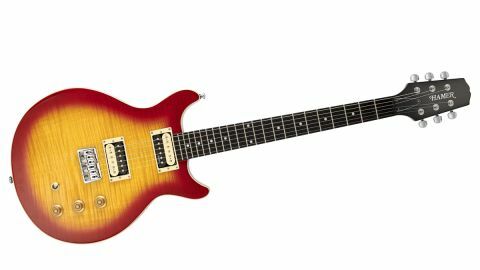 The new Sunburst model sports more of a medium C shape that reminds us of the PRS SE ‘Wide Fat’ feel. Anyway, we like the new Hamer shape. Combined with the big frets, shredder-friendly fingerboard radius and the low action, this is one of the most comfortable guitars to play you’ll find anywhere. Upper fret access is boss, too; just look how deep those cutaways are. Plugging in, the Sunburst reveals an impressive level of sustain. We reckon you can attribute a lot of that longevity to the through-body stringing. As you would expect from the mahogany and maple construction, this guitar offers classic rock tones. The bridge unit is bright and punchy, while the neck pickup is warm and jazzy. There are no real surprises here. You get all the sounds you want and expect from this style of guitar. That said, we spent a lot of time in the middle position. The balance of light and dark is perfect for slightly overdriven Stones riffs and slap-happy rockabilly and country licks. easy ride. The sub-£1,000 sector is hotly contested and the Sunburst will find the likes of the Yamaha Revstar RS620 and Guild S-100 Polara breathing down its neck. Both those guitars street at a similar price to the Hamer. The PRS SE guitars will be gunning for the Sunburst, too. What we will say is, if you’re looking for a twin-humbucker classic-style solidbody, the Sunburst should be on your radar. The bottom line is it’s great to see Hamer back in business. Yes, we miss the USA-made guitars, but just seeing that name on new instruments doesn’t half warm the old cockles. Let’s hope the life support stays firmly switched on from here on out, and we’ll all be celebrating Hamer’s 50th birthday in 2023.